SCIENCE AND MAGIC IN THE FOREST. Upon arriving at Mashpi Lodge, you are entering far more than just a five-star hotel in an exquisite location: you are accessing a research station that is at the forefront of rainforest protection. Before the construction of the lodge was even completed, the Mashpi project hired a biologist to carry out an ambitious research project. Said biologist was tasked with finding out as much as possible about the diverse ecosystem that thrives within the 1,200 hectare (3,000 acre) Mashpi Reserve. The information this biologist gathered became part of the lodge’s conservation and resource management strategy, strengthening the Lodge’s concept of sustainable tourism and forest preservation. Our science and investigation projects are now quite ample and varied in scope. CHECK OUT OUR BLOG TO FIND OUT MORE! The final goal of this whole project is to bolster both the importance of research and enrich our knowledge of the lodge’s surrounding ecosystem. This knowledge is then shared with local communities, our guests and the world at large, all with the aim of underlining the importance of conserving this fragile and fascinating bio-region. Our research efforts have grown over the years. We have signed collaborative agreements with national and international conservation organizations. 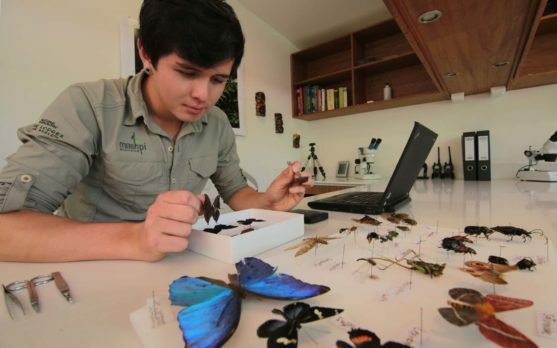 We have worked with several universities, participating and designing different research projects that involve butterflies, mammals, birds, fish, amphibians, reptiles and macroinvertebrates. We have even discovered entirely new species and shared them with the international science community! All of these initiatives have allowed us to see how our efforts should go beyond merely protecting our reserve and its hotel. Science at Mashpi Lodge must be a combination of research, education, ecotourism and community support in order to truly have the impact that we desire. Investigation is a key aspect of the Mashpi project. We are immensely proud of the discoveries and the contributions that we have made to forest conservation throughout the years. Find out more about the team of dedicated biologists and para-biologists who spend their days and nights within the forest, observing, measuring, counting, numbering, labeling and looking for new species to share with the world! We are currently working on several ways for our guests to get more involved with our research and conservation efforts. Guests are welcome to volunteer their time to help with research, donate scientific and/or expedition equipment, and provide funding for our different initiatives. The ecosystem of the Chocó is a world still being discovered by science, home to innumerable species that are waiting to be discovered by human eyes. Get a more in-depth sense of our amazing forest by reading our latest blogs. Located to the west of the lodge, the Life Center was conceived as a place for learning and discovery. It is here that our guests learn about the numerous species of butterfly that are found in this region, observing the entire process of metamorphosis – from egg to beautiful butterfly. To this day, around 300 species of moths and butterflies have been identified in the Reserve. About a dozen can be seen at the center itself. Most of the interpretation in the center is provided by our guides or our staff that hails from the local communities. With some 400 species of birds spotted to date – 35 of which are endemic (meaning they’re only found in Mashpi’s nearby forests) – Mashpi’s Reserve is a birdwatcher’s paradise. You don’t need to be an experienced ornithologist or even travel that far to see and enjoy the mystical beauty of birds.